People's wardrobes and what they chose to keep in them is their business. Unless they are very famous, when they become our business. Or, good business, in the case of the Victoria and Albert Museum (V&A). Based in London's South Kensington area, the V&A - one of the UK's leading arts venues - has become a celebrity closet specialist. It did very well with an exhibition of David Bowie's outfits in 2013, followed in 2015 by another dedicated to the fashion designer Alexander McQueen. The next popular icon to get the museum's blockbuster frock treatment is the Mexican artist Frida Kahlo, in its summer show: Frida Kahlo's Wardrobe (16 June - 4 November). The wardrobe in question had been sealed for 50 years at her home - The Blue House (La Casa Azul) - in Mexico City. 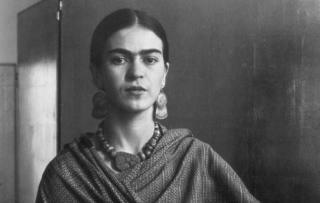 This was on the instruction of her husband, the muralist Diego Rivera, when Kahlo died aged 47 in 1954. In 2004 some curators dared to sneak a peak only to discover to their delight a rainbow-coloured treasure trove of goodies inspired by the late painter's love of Mexican folk-art. There were examples of her trademark "Tehuana" frocks, hand-made accessories, love letters, head-dresses, and assorted decorated plaster corsets and prosthetic limbs that the long-suffering artist wore having contracted polio as a child and then being crushed in a streetcar crash as a teenager. This is the first time the collection has travelled outside Mexico and will make just about as perfect a subject for a summer show as you'll ever likely to get. The Hayward Gallery on London's Southbank has only been closed for a comparatively short time. It shows off its refurbished concrete galleries with its first major UK retrospective of Andreas Gursky's monumental photographs (25 January - 22 April). The wonderful Kettle's Yard in Cambridge has been closed for a much longer two-and-a-half years for its makeover treatment. It will re-open with new four-floor education wing on 10 February and an installation by the British-Bangladeshi artist Rana Begum. Ragnar Kjartansson is another contemporary artist presenting an enticing show in 2018. He has emerged in recent years from Iceland's hipster scene to become the darling of both the art world and art lovers with his surreal, theatrical artworks. Kjartansson was unlucky not to win the prestigious Cardiff-based art prize Artes Mundi in 2014, with his mesmerising multi-screen video installation, The Visitors (after Abba's 1981 album). He returns to Wales, to the National Museum Cardiff with a new performance piece (co-commissioned with Artes Mundi). It is called The Sky In The Room after a 60s Italian song Il Cielo In Una Stanza, which will be played by a revolving roster of organists. It sounds odd. It will be odd. And probably worth a visit (3 February - 11 March). Good news if you are looking for an excuse to go to Paris, there are at least two additional reasons for a trip to the City of Lights this spring. The first is to check-out Rem Koolhaas's re-modelling of Galeries Lafayette historic building on 9 Rue du Platre into an vertical, versatile "curatorial machine". Paris is coming to London in April in the rugged shape of Auguste Rodin's sculptures. The British Museum is presenting an exhibition of the Frenchman's work (26 April - 29 July) alongside pieces from ancient Greece that inspired him, in particular work by Phidias who carved the sculptures on the Parthenon. Rodin used to visit the British Museum to sketch them and seek inspiration. If sculpture is your thing the Yorkshire Sculpture Park has a summer treat for you. From the 26 May onwards, it will be hosting the UK's most extensive exhibition of Giuseppe Penone's work. There can be few better places on the planet to enjoy the Italian's nature-inspired sculptures. The following month the National Portrait Gallery in London is offering something completely different. Michael Jackson: On The Wall (28 June - 21 October) marks what would have been the late singer's 60th birthday and features artworks made in response to the man and his music - Andy Warhol, Grayson Perry, and Kehinde Wiley to name but three. One sure-fire big event in the second half of the year will be the opening of the V&A Dundee on the banks of the river Tay. Designed by the Japanese architects Kengo Kuma & Associates, the £80m statement building will place international design in a Scottish context: Charles Rennie Macintosh meets Coco Chanel. It looks fantastic. As does the Scottish National Gallery's Rembrandt exhibition (7 July - 14 October), which looks at the Dutch master's work and how public opinion towards it has changed.